Senator Marco Rubio was out on the Sunday talk shows stating that the draft Illegal alien immigration bill about to be dropped on the US Senate is not amnesty. This is a lie if there is any path to citizenship in the bill for illegal aliens. You can legalize them, give them the right to work and this alone will solve the issue at hand of them being in the country already, illegally. There is no reason to put citizenship on the table. The illegal alien issue can be solved solely by providing a path to legal residency. It is fiction to say that those here will simply be put at the end of the line as many of them could not even get in line to come here if they had stayed in their own counter. Personally I think they should all be deported, but as a realist, if this is not possible, then fine offer some path to legalization for those who have not committed crimes other than illegal entry and working without authorization. And for the others, show them the door. We have enough criminals here already. Citizenship is a valuable reward for those who come here legally and agree to live by our rules. We should not give this reward away so cheaply. As for Senator Rubio and any other Republican who backs this POS legislation, don't count on my vote for President. I'd just assume not vote at all. The Police Officer Gun Control Survey posted at PoliceOne.com is an amazing confirmation that the Democrat-push gun control legislation will do little to no good in combating gun crime, starting with the Democrat demand of banning high capacity magazines. The high capacity ban that the Democrats are pushing is stupid for a number of reasons. There are literally millions of them in existence already. Banning high capacity magazines does nothing to prevent shootings. Are Democrats saying that it is not so bad if a shooter manages to shoot up to ten people as opposed to shooting more? And let's not forget the idiotic and completely unenforceable law in New York State forbidding you to put more than 7 rounds in your magazine. Of course there is plenty of opportunity for police to catch law-abiding people breaking this law. They can also catch criminals breaking this law, but they will already have them for criminal use of a firearm. A crime they are likely to punish them lightly. Of course, the cornerstone of current anti-gun legislation is the goal of banning 'assault weapons'. The police polled, logically noted that this is not very useful legislation. One reason of course is that rifles and handguns that are not classified as assault weapons function identically to the targetted weapons and are equally lethal. 2.) The majority of respondents — 71 percent — say a federal ban on the manufacture and sale of some semi-automatics would have no effect on reducing violent crime. However, more than 20 percent say any ban would actually have a negative effect on reducing violent crime. Just over 7 percent took the opposite stance, saying they believe a ban would have a moderate to significant effect. The two issues above are the biggest gun control legislative goals of Congressional Democrats. As far as America's police are concerned, these measures are useless at best and worse potentially harmful. You know what the sad thing is about this, is that there are lots of inner-city kids and their parents that probably can gain from some sort of community support in raising their kids, especially single parents. But these are not the kids that Democrats are interested in inserting themselves into their lives. Nope, it is the kids of conservative parents. Sorry, but this lady is dead wrong. For both good and bad, kids do belong to their parents. If I decide that my child is not going to do something or is too young to learn about something, that is between me and my wife just as when we decide to teach our child something that other parents, or meddling adults think I should not. As noted before, (Canada Shipping Oil to US By Rail To Get Around Obama's Keystone XL Blockade) crude oil from Canada is going to come to the US, whether the Keystone XL pipeline get built or not. The failure of the Obama Administration to approve the Keystone XL Pipeline has been a boon to the railroads who are shipping ever greater amounts of crude oil to the US. Unfortunately, rail transport is not as efficient or safe as rail when transporting liquids. So, it comes as no surprise to me that one of these trains has derailed, spilling oil. 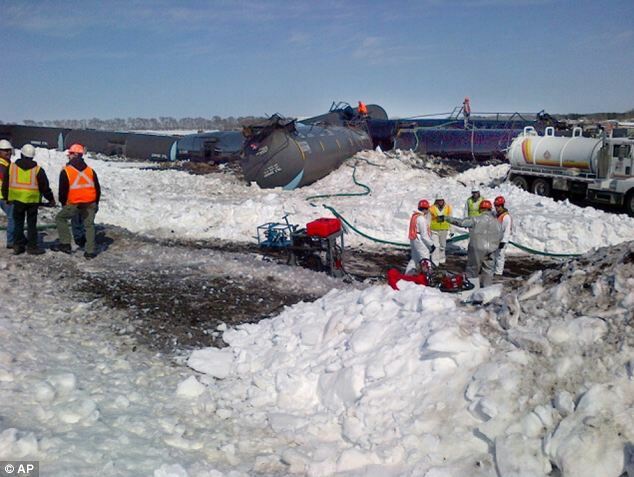 A mile-long train hauling oil from Canada derailed, spilling 30,000 gallons of crude in western Minnesota on Wednesday, as debate rages over the environmental risks of transporting tar sands across the border. It is going to happen again. Surely many other transportation professionals will agree. Such large quantities of crude oil should be moved by pipeline. 'It is good business for the rails and bad safety for the public,' said Jim Hall, a transportation consultant and former chairman of the National Transportation Safety Board. There is video discussion at the link. Simply put, we need to have immigration rules. For them to mean anything, we need to ensure that the rules are respected and to ensure that, they need to be enforced. The alternative is the situation that we have now. There is no fear of breaking immigration law. There is little fear of being caught and even if they are caught, there are many examples of people being set free to continue living (and working) here illegally. Anyway, if the country is so willing to legalize illegal aliens, why not just annex Mexico. Then we can offer citizenship to all Mexicans, not just those who decided to violate our immigration laws.